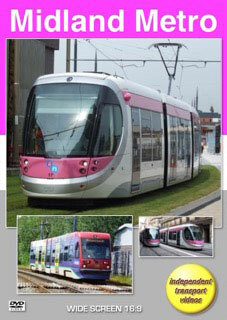 The Midland Metro tramway operates between Wolverhampton and Birmingham in the West Midlands region of the United Kingdom. It is operated by National Express. Services began in May 1999 with a fleet of 16 Italian built Ansaldo Firema T69 trams. The original route ran from St George's at Wolverhampton, via West Bromwich terminating at Birmingham’s Snow Hill railway station. In 2012 the first extension began to the tramway, which included an on street section to link Snow Hill to Birmingham’s New Street station in the centre of the city. A further extension will take trams to Centenary Square, which should be completed by 2017. As the system became more and more popular the existing trams were found to be too small and in some cases unreliable, so a decision was made to replace them with a fleet of 20 CAF Urbos 3 trams manufactured in Spain. Delivery began in 2013 and has now been completed, the trams being numbered 17 – 36. This programme takes a look at the system in three parts. The first in June 2015, the second, featuring a visit by the Light Rail Transit Association (LRTA) to the system on the 11th May 2016, including a visit to the Wednesbury tram depot complex and the third visit in June 2016 to see the completed street section in central Birmingham. We start our visit to the system in June 2015 at Wolverhampton St George's and then board 08, an Ansaldo Firema T69 tram to travel to Birmingham Snow Hill. You will experience these trams as we travel along the line as well as passing a number of the CAF Urbos 3 trams. At Snow Hill we briefly leave the station to take a look at the tramline construction work taking place in central Birmingham. Back at Snow Hill we board CAF Urbos 3 tram 28 and travel to Jewellery Quarter to film the trams alongside the national rail line that runs parallel to the tramway. We then board CAF tram 24 and travel to West Bromwich Central to film the action there. We are lucky to see some T69 trams passing through including number 10 sporting the new silver/magenta livery. From here we board CAF tram 26 to Wednesbury, Great Western Street and again record the trams passing through. Our final ride of the day is onboard CAF tram 25 for the return to Wolverhampton. Alighting at The Royal we record the street running here and along Bilston Road. In the next part of our programme our cameras join the LRTA and board a specially chartered tram, CAF 30 and get a drivers eye view as we travel to the tram depot at Wednesbury. Here we visit the Workshop and the Control Room as well as seeing the ‘spare’ trams lined up ready to go into service. We leave the depot and travel to Bull Street, as at the time of filming this was as far as the trams could go prior to the complete opening of the new section on the 30th May 2016. We get a good view of the new tracks after leaving Snow Hill from the drivers’ perspective. The day concludes with us travelling back to Wolverhampton St George's. The final part of our programme begins on the 7th June 2016, nine days after the opening of the new street section from Bull Street to Grand Central (New Street Station). We arrive at Stephenson Street (Grand Central) onboard CAF 21. Our cameras then film along Corporation Street, Bull Street, Colmore Circus Queensway, Colmore Square and Bull Street. Plenty of tram action, as the trams return to the streets of central Birmingham for the first time since 1953! Our penultimate views show the trams in Stephenson Street at the current end of line in Birmingham, with the final views showing the trams at Wolverhampton St George's, the start of the line. Enjoy your visit!